This is a Pack of 2 plugins. By buying this Pack you save 50% on the second item. The plugin will turn your WordPress site with Avada them into the real Content Management system. You will be able to display your custom post types, taxonomies and field using different layouts. To see what this Pack can do check out individual plugin descriptions. 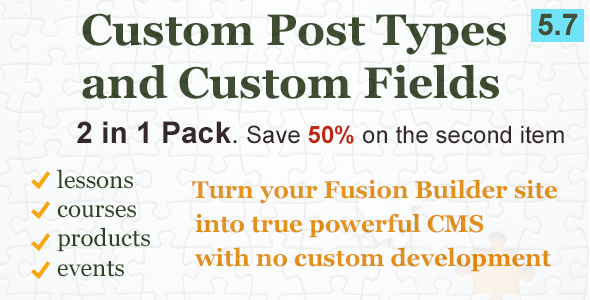 This plugin extends the Fusion Builder Blog, Portfolio and Recent Posts elements to work with any Custom Post Types, Custom Taxonomies, Terms and Fields. With this plugin you will be able to put your own custom content in any place on the page the same way you can put Blog, Portfolios, Recent Posts with the original elements. Please, see the Demo of this plugin.